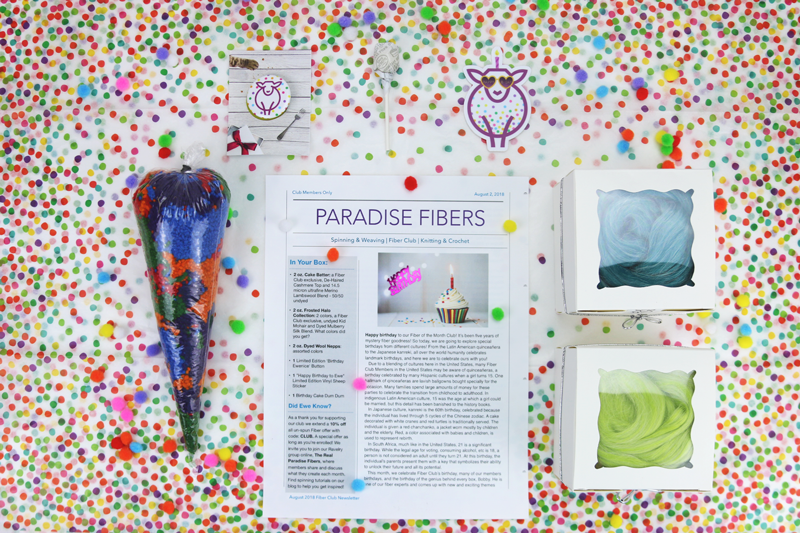 Happy birthday to our Fiber of the Month Club! It’s been five years of mystery fiber goodness! So today, we are going to explore special birthdays from different cultures! From the Latin American quinceañera to the Japanese kanreki, all over the world humanity celebrates landmark birthdays, and here we are to celebrate ours with you! Due to a blending of cultures here in the United States, many Fiber Club Members in the United States may be aware of quinceañeras, a birthday celebrated by many Hispanic cultures when a girl turns 15. One hallmark of qinceañeras are lavish ballgowns bought specially for the occasion. Many families spend large amounts of money for these parties to celebrate the transition from childhood to adulthood. In indigenous Latin American culture, 15 was the age at which a girl could be married, but this detail has been banished to the history books. In Japanese culture, kanreki is the 60th birthday, celebrated because the individual has lived through 5 cycles of the Chinese zodiac. A cake decorated with white cranes and red turtles is traditionally served. The individual is given a red chanchanko, a jacket worn mostly by children and the elderly. Red, a color associated with babies and children, is used to represent rebirth. In South Africa, much like in the United States, 21 is a significant birthday. While the legal age for voting, consuming alcohol, etc is 18, a person is not considered an adult until they turn 21. At this birthday, the individual’s parents present them with a key that symbolizes their ability to unlock their future and all its potential. This month, we celebrate Fiber Club’s 5th birthday, many of our members’ birthdays, and the birthday of the genius behind every box, Bobby. He is one of our fiber experts and comes up with new and exciting themes every month! 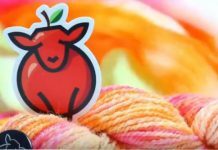 Known in our Ravelry group by the username Heavyworsted, he spends his days in a sunny office above the shop, brainstorming new fibery adventures for all of us to enjoy! 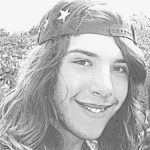 Drop by the group and wish him a happy birthday this month! Members received a newsletter, 2 oz. 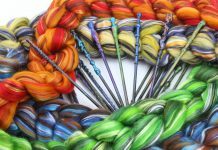 of Dyed Wool Nepps, 2 oz. of Frosted Halo Collection (2 colors), 2 oz. 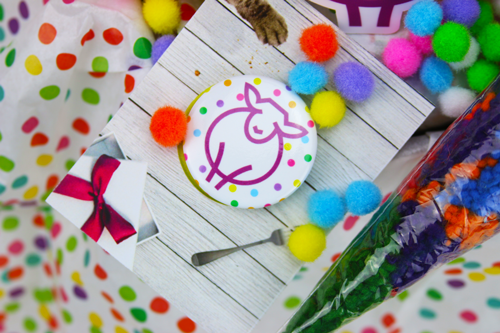 Cake Batter Blend, a limited edition vinyl 'Happy Birthday to Ewe' sticker, and a Birthday Ewenice Button. What colors of Frosted Halo Collection did you receive? 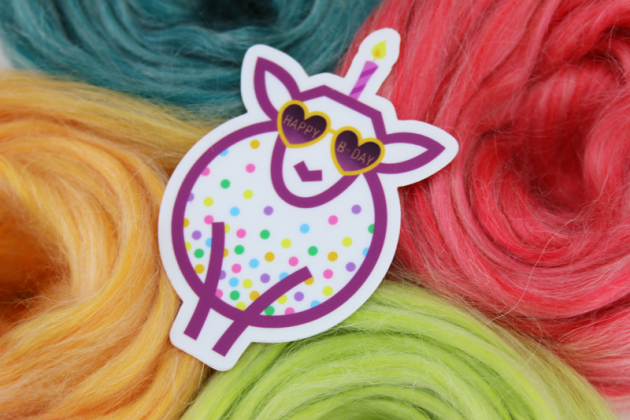 Happy Birthday to Ewe Vinyl Sheep Sticker. For us here at Paradise Fibers, no birthday would be complete without cake! Therefore, we have provided members this month with Cake Batter, a 50/50 blend of 14.5 micron ultra-fine merino and de-haired white cashmere top! 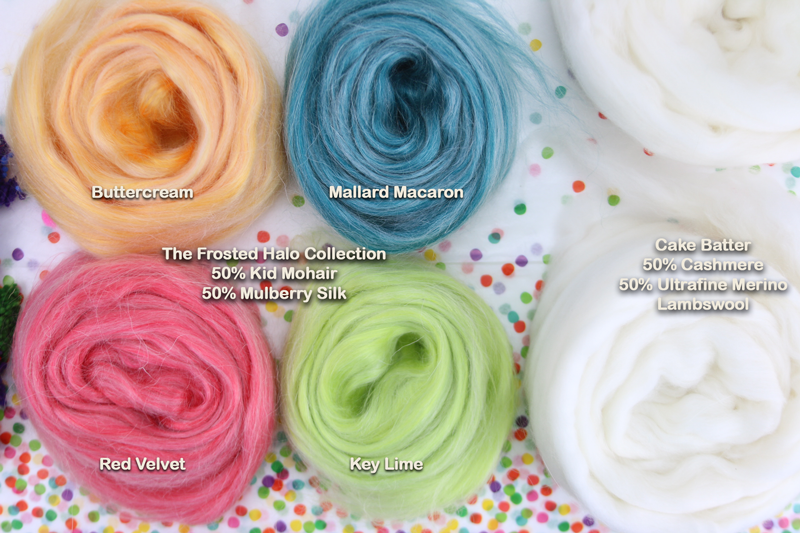 Next, we have two colors of our brand new Frosted Halo Collection, a 50/50 blend of Dyed Mulberry Silk and Kid Mohair Top. And what cake would be complete without sprinkles? 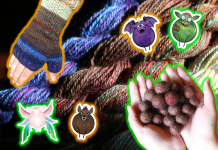 For your sugary delight, we have included an assortment of dyed Wool Nepps! 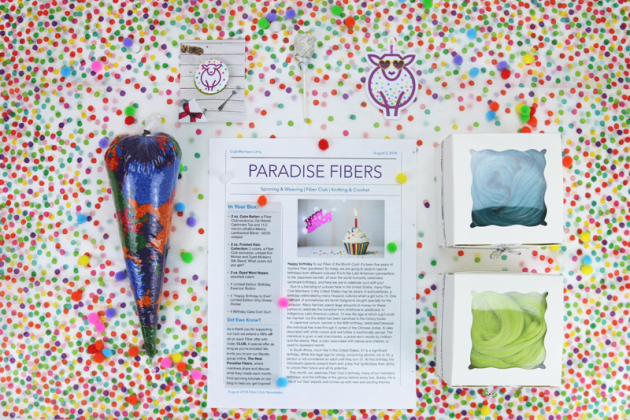 Find all of these fiber and more on our website. 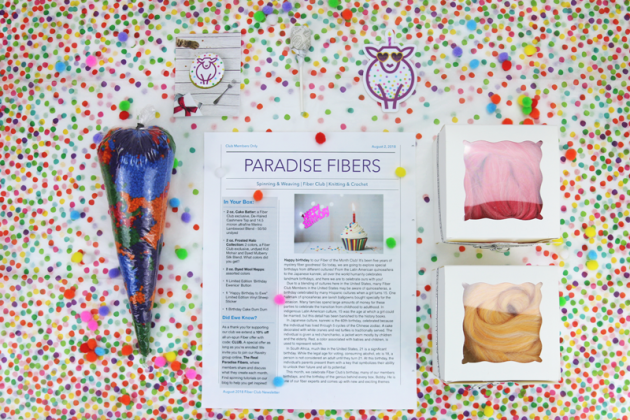 Not a member of our Fiber Club? 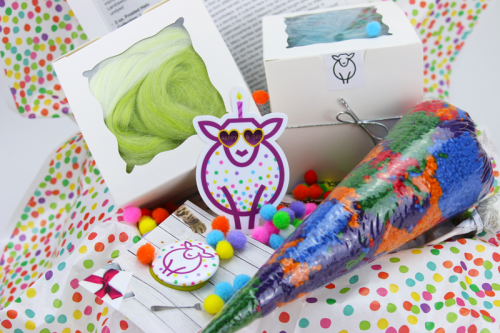 Sign up today to get a curated, themed, box like this delivered to you each month! Cancel at anytime. 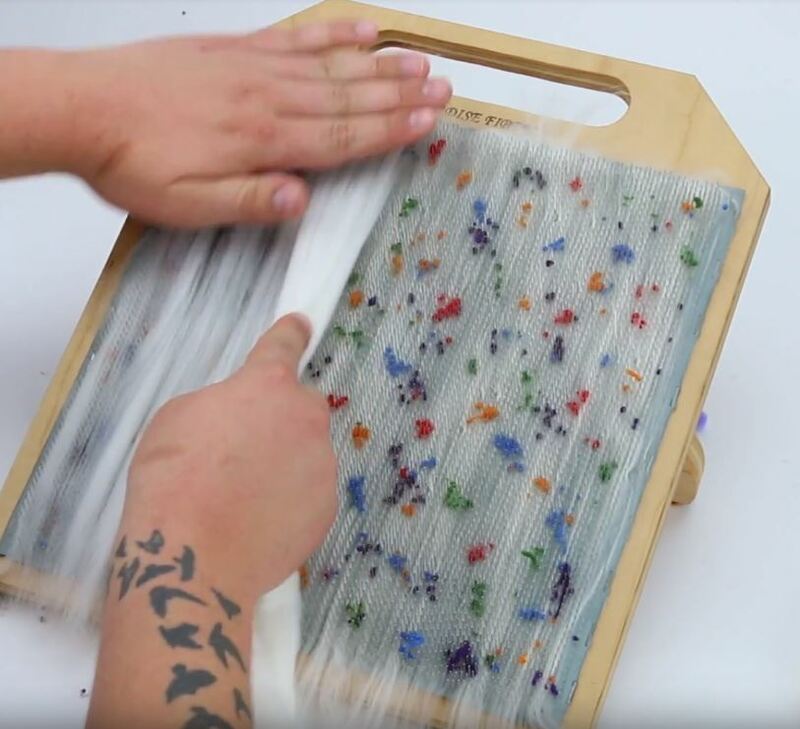 In the video I am drafting a layer of the Cake Batter fiber blend onto the Paradise Fibers Blending Board (90tpi), I make sure I have one even layer of the fiber combed onto the board before sprinkling dyed Nepps (felted balls of wool) on top. After I’ve carded the Nepps down I place another layer of Cake Batter to seal the nepps in place. I now have a center pull rolag ready to spin! 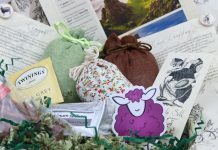 You could also use a drum carder or hand cards to blend your choice of wool with the nepps to achieve similar results. When spinning Cashmere, a woolen approach will help fight the short staple length of the fibers. This will make the fibers easier to draft, especially if a thin rolag is made. This will also create a lofty and lightweight yarn! I spun the rolag with as minimal twist as possible on a smaller whorl. Adding just enough twist to keep the integrity of the yarn so that I can actually use it in a project. Use a short 2 handed draw with a draft area that is 1 inch wide. Some of the Nepps did fly out while spinning, this is normal. Most of the nepps should grab onto your single and get trapped in your drafting triangle as you spin. It truly is a confetti explosion on the floor after you’ve finished your single, this is all part of the fun! I created a total of 4 rolags, so I spun 1 and a half on one bobbin and one and a half on another, leaving one for me to play with later. 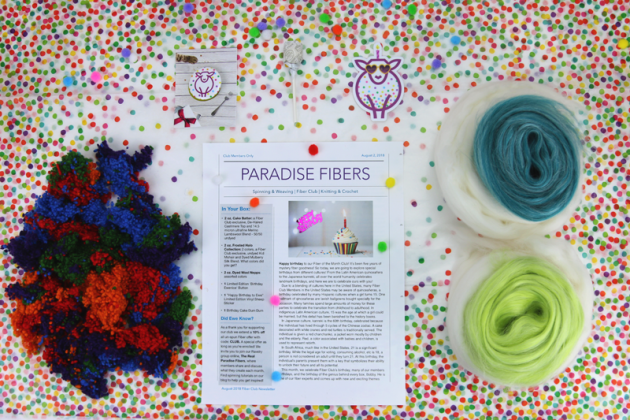 I used our Paradise Fibers Lazy Kate to hold the bobbins and keep tension as I drafted out the two singles and plied them into one funfetti birthday cake inspired yarn. 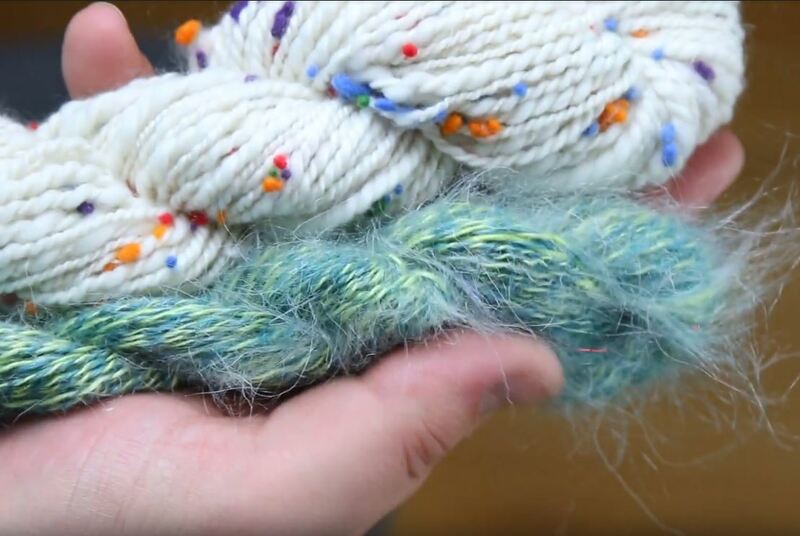 Soak in lukewarm water with your favorite fiber conditioner, gently thwack, and let air dry. Mohair or mohair silk blends can be slippery and harder to spin (especially when blended with another slippery fiber like silk). This can take some getting used to, but with a little practice you will have it down in no time at all. Beginners can spin this fairly easily due to its long staple length of 4-6 inches. 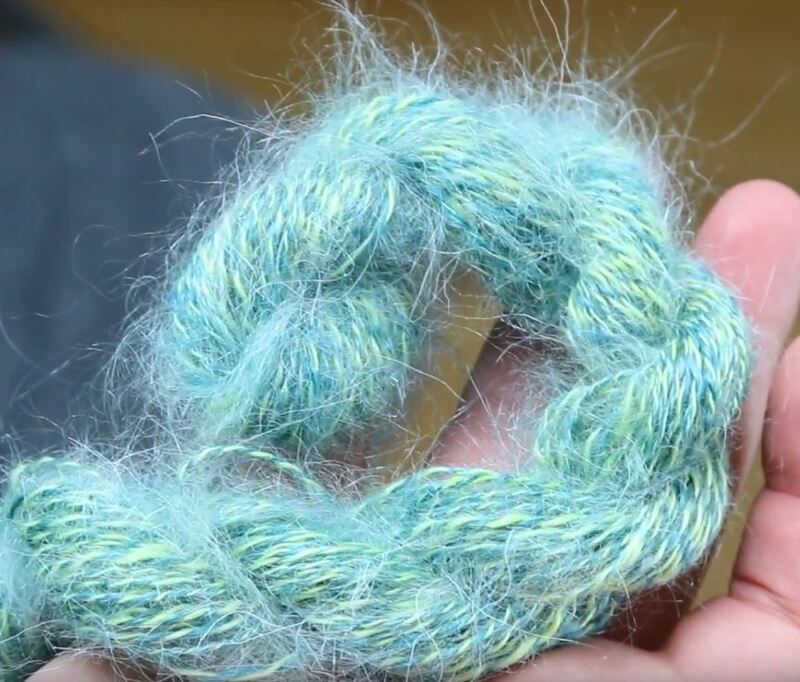 Because this fiber is more slippery than most wool, it needs less tension to spin. 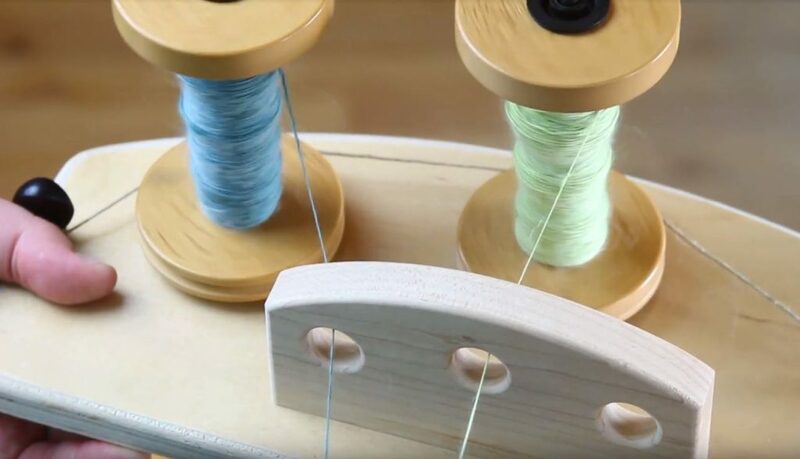 Loosen your tension and spin with a medium amount of twist, using a long or short draw. You’ll notice this fiber drafts more freely than most wool, that is due to the scales on the individual strands of fiber being smaller and more dispersed than most wool. Be careful not to add too much twist to your mohair yarn, or you will end up with string. A low twist enhances the natural luster of this fiber, allowing light to bounce off the surfaces producing a rich halo and a glowing effect! Adding fine wool to mohair will help increase the memory of your yarn and make it a bit easier to spin. I spun two singles on two separate bobbins and then plied the two singles together in the opposite direction. You can see how to do this in our previous fiber club unboxing tutorials! 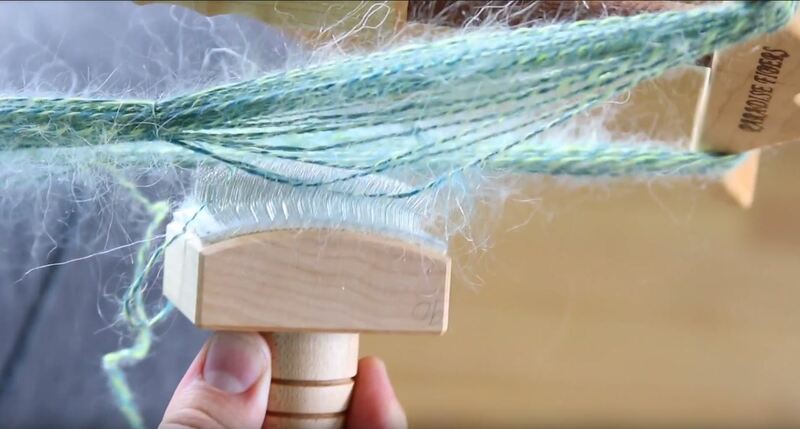 After winding my freshly spun 2-ply mohair yarn onto the Paradise Fibers Adjustable Niddy Noddy, I used a 90 TPI carding brush to lightly brush the yarn to add even more halo! This pulls strands of mohair out, making the yarn ultra fluffy! I just love this technique for mohair yarn. Have you tried it? Brushing to mohair yarn to increase halo! I think these two yarns would make a lovely, soft cowl or hat with a mohair trim for a nice fluffy frosting edge. What do you think? 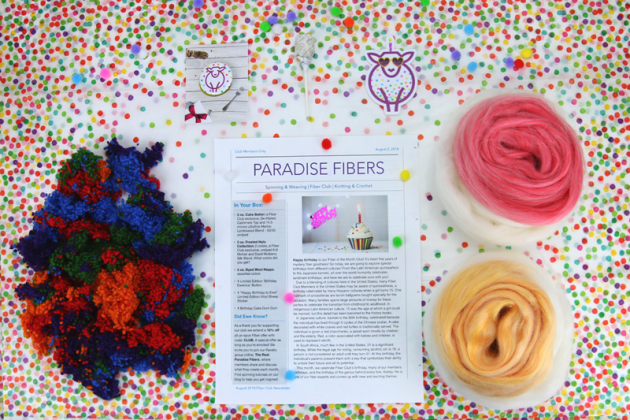 Birthday Cake Inspired Yarn! Ready to Create with. 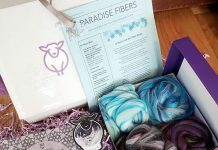 Did you receive our August Box? Share what you decided to create in the comments below. 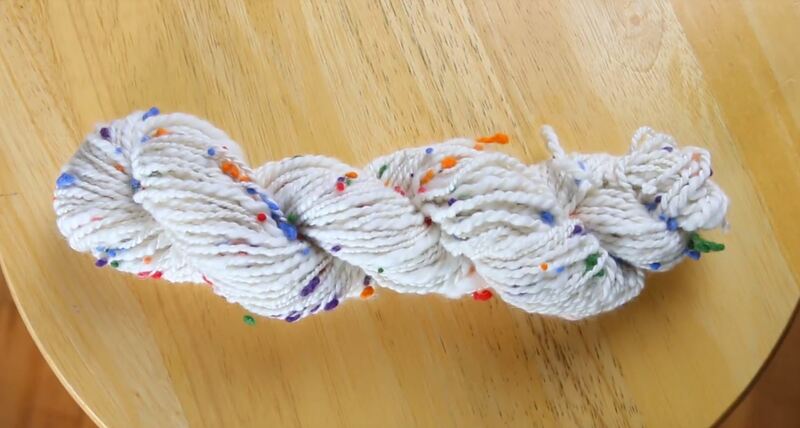 A fun twist on speckled yarn? We think so! Six times finer than human hair! 14 microns, 2-4 inch staple length. 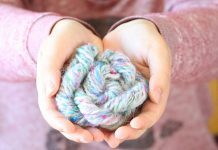 Next articleHow to Make Tweed Yarn in 10 Easy Steps!